Connecticut small business owners & individuals are being crushed by rising health care costs. HB 7267 & SB 134 are some Public Option solutions. More information on a Public Option here. RSVP for an upcoming event in your area. Join the Public Option Support page here. MAY 3RD RSVP for the CCAG and Democracy for CT Climate Forum on how climate change is impacting our communities and learn about proposed laws currently before the legislature. Hear from experts about expanding clean energy, addressing gas pipeline and fracking issues, ensuring greater protection for our environment- and more. 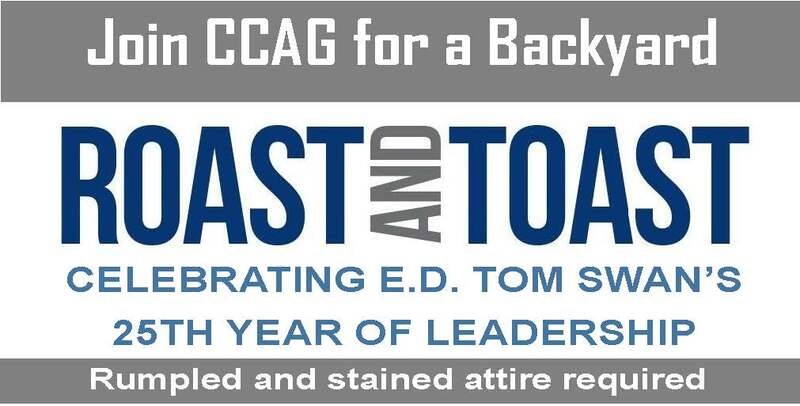 MAY 4TH- Join CCAG & Protect Our Care CT for a legislative brunch in Groton where conversations about policies and plans to protect our healthcare will be happening. Find out what CT State Legislators are doing to ensure we all have access to high quality, affordable care & to hear more about how you can get involved to make a difference in your community. Please RSVP by April 31st. This is a free event. 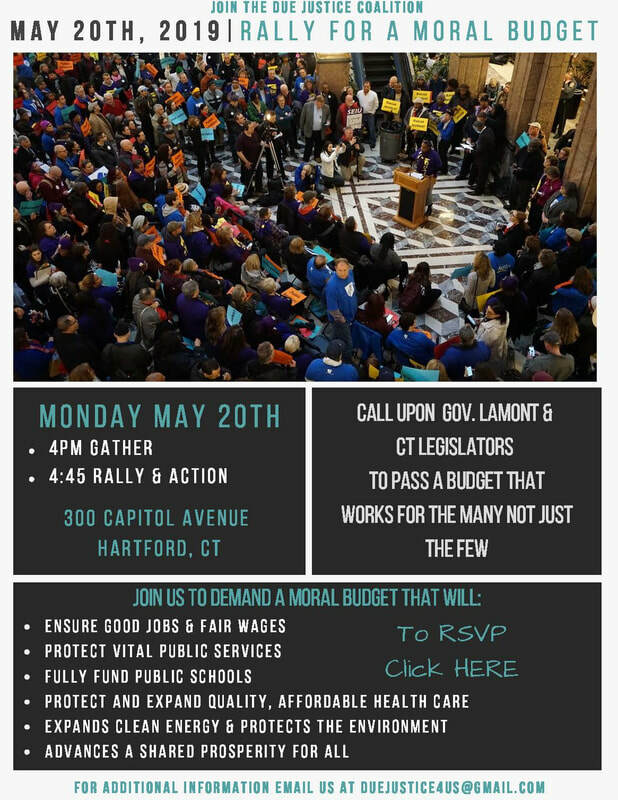 ​On May 20th, we will stand in solidarity with the DUE Justice Coalition (Democracy, Unity Equaltiy) to demand that our elected leaders pass a MORAL BUDGET that that supports all CT residents and asks the wealthy to pay their fair share. RSVP today! ​Thank you to everyone who stood in solidarity with CCAG and the D.U.E. Justice Coalition on April 4th! We continue to demand that our elected leaders pass a MORAL BUDGET that supports all CT residents and asks the wealthy to pay their fair share. Join the CCAG e-list for updates as this fight continues. Thank you to the 2018 CCAG Awardees, Speakers, Presenters, Host Committee, Donors, Arts Community and Volunteers for making our 47th Anniversary Celebration a night to remember! The Nancy Benedict Social Justice Award! The Laddie Michalowski Community & Labor Award! JOIN US FOR THE CELEBRATION! RSVP Today! Tickets are a suggested $50 donation & benefit the CT Citizen Action and Research Groups. CCAG tickets are not tax-deductible. The first $50 of each CCRG ticket is not deductible. Thank you in advance for helping us to remain the longest standing Citizen Action Group in the nation. CCAG now more than ever! Program book form to purchase an ad is available here. Auction item donor form is here. OUR AMAZING HOST COMMITTEE AND TABLE CAPTAINS! ​CCAG E.D.Tom Swan has agreed to throw himself into the fire in support of the Connecticut Citizen Action Group. Help us to honor his sacrifice, join us for the party! RSVP for directions and details. Ticket price includes: BBQ & all the trimmings, beverages and show. Donations to CCAG are not tax deductible. #DoorsForJustice DAY OF ACTION- For activists and volunteers who are committed to justice!! ​Good Jobs-Fair Wages; Access to Quality Public Education; A Vibrant & Fairly Funded Public Sector; Racial, Gender and Immigrant Justice; Democracy in our State and in Our Work Places; Healthy Communities & Environmental Justice. Don't forget to share this event with family & friends! Share on FB. Download the flyer here. Looking forward to seeing you out in the backyard! RSVP today! Uniting tens of thousands of people across the country to challenge the evils of systemic racism, poverty, the war economy, ecological devastation and the nation’s distorted morality. Read more here. ​Please join us in Connecticut for week 5 of the national campaign and call to action. RSVP today! Where: At the CT State Veteran's Memorial @ Minuteman Park (in front of the Legislative Office Bldg.) Get directions. Last year - the CT General Assembly changed eligibility levels for the Medicare Savings Program (MSP) impacting 113,000 seniors & people with disabilities. Legislators also cut over 13,000 low income parents off of all of their health care coverage under HUSKY A- limited access to dental services for all adults on Medicaid and cut reimbursement for primary care providers. CT's Medicaid program provides essential healthcare & benefits to approximately 800,000 CT residents- including elderly, low-income parents & people with disabilities -- vital assistance that if changed as proposed, would leave the healthcare of thousands of our neighbors in jeopardy. The Good News- because YOU spoke up and showed up at the Capitol, called your legislators, wrote Op-Eds and made sure our voices were heard, the CT General Assembly reversed their decision and rescinded the cuts to MSP. The Bad News This fix was only temporary. As it stands, our state's most vulnerable citizens are scheduled to lose their benefits on July 1, 2018- and the cuts to HUSKY A parents, dental benefits & primary rates still stand. That's why your voice, your presence and your actions are needed now more than ever before. Together we can stop these reckless cuts to MSP and Husky A and keep Connecticut families health, safe and secure. Please join us on Wednesday, Feb. 21st at 4pm in Hartford at the Capitol- RM 310 to discuss how we can work to prevent these damaging and hurtful cuts and protect CT's signature health care program and our most vulnerable citizens. 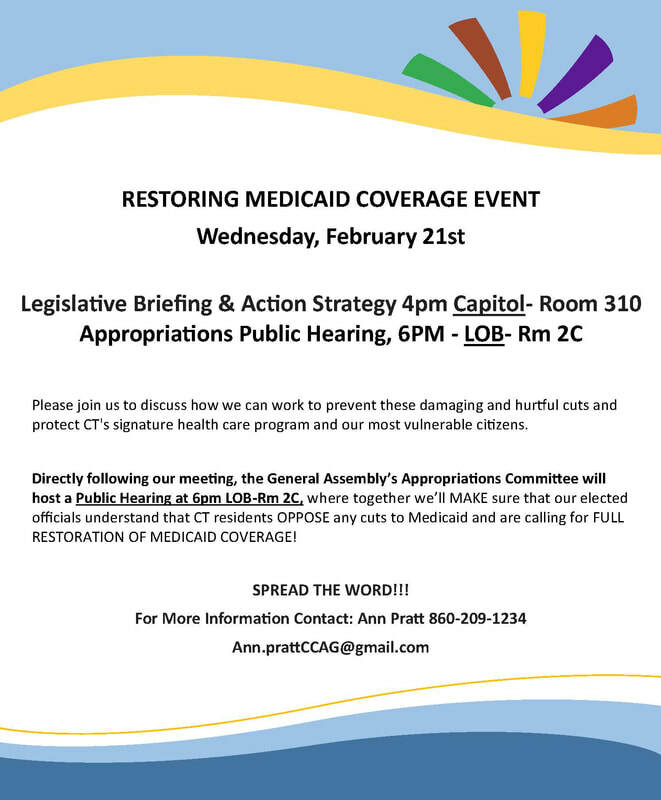 Directly following our meeting, the General Assembly's Appropriations Committee will host a Public Hearing at 6pm, where together we'll MAKE sure that our elected officials understand that CT residents OPPOSE any cuts to Medicaid and are calling for FULL RESTORATION OF MEDICAID COVERAGE! ​Join the DUE Justice Coalition for regional organizing sessions bringing together individuals, labor, faith, advocacy and community organizations to build and advance a bold agenda for a Connecticut That Works For All- Not Just the Few. Haven't registered yet? Scroll down for details for each Congressional District then RSVP for yours! Guest Speaker: Richard Kirsch, Author of Fighting for Our Health: The Epic Battle to Make Health Care a Right in the United States & Former Senior Fellow at the Roosevelt Institute. Tickets are a suggested $50 donation. We have a LOT of work to do, please be as generous as possible. CCAG tickets are not tax-deductible. The first $50 of each CCRG ticket is not deductible. $1000+ - Citizen Action Hero! ​with government to make a better world. There is nothing like the energy of excited students realizing they can make a real difference! Kudos to CCAG Organizer Ann Pratt, who led this all-day adventure at the Naugatuck Community College (Waterbury Campus). Hors d’ oeuvres and drinks poolside! Thank you to everyone who raised a glass, and supported us for Sunset on the Beach! Your donations are hard at work today! Proceeds benefitted the Connecticut Citizen Action and Research Groups. Contributions to CCAG are not tax-deductible. More details here. ​Everything you need to know to march is here. Let''s roll! Can't make it to DC? No worries, find a Sister March near you here. JOIN US on November 10th as underpaid workers stand together throughout the country for fair and equitable wages. On the Global Day of Action, CT will be turning out to stand with workers Fighting for $15! Join us as we march from McDonalds to the L.O.B where they will then have a forum and will share their stories. Fast Food, Homecare, Healthcare, Childcare, Security, and many other workers will be joining elected officials to share their stories. When 42% of working people in the United States are paid less than $15 per hour, it means the economy is way out of balance. Wages have remained stagnant for years -- hurting families, communities, and the economy. In particular, women and people of color are disproportionately impacted by corporations that refuse to pay fair and equitable wages. Join CT and friends across the nation to demand a fair wage on November 10th, RSVP today!